It brings me immense pleasure to share that I, along with 24 other WOMEN bloggers are celebrating #9daysofwomanhood throughout Navratri. I thank my friend and co-blogger Preetjyot Kaur Mehra for introducing me. I am a huge fan of her blog My Little Muffin where she talks about breaking stereotypes and raising her girls with power and strength! I would like to introduce my readers to my friend & co-blogger Jasmeet Kaur. Her blog talks about interesting parenting mantras and simple DIY activities for toddlers, making parenting a breeze! You can read her blog on the prompt for today at Mommy Voyage. I don’t know about you, but I am certainly done with the negativity in our lives. The rapes, the murders, the crimes on children — all just seem incessant. Acceptable to us or not, they continue to happen, all because none of it is in our control. But what is in our control, is to try to be positive and move on in life with hope. And if you really come to think of it, we should ideally be Happy being a woman in today’s times! What makes me Proud of being a woman in today’s times? The women of today are not like the cattle that have been just moved from one spot to another and yielded benefits for its “owners”. We are well aware, well-groomed, confident individuals and know about our rights more than we did in the previous generation. We are Not ashamed of speaking our mind or voicing our opinions. If we have something to say, we actually do and fear no consequences. The beauty is that we don’t always have to scream because the men around us are equally aware. This was not a common possibility in the previous generation. Women of today don’t shy away from inviting our men for dinner before they make the move. We love you, and we don’t shy away from telling you that! Women are stereotyped for being obsessed with our looks, but that has changed drastically. We can choose to dress up like a fairy, or a tomboy, or even walk down in a comfortable set of clothes, not bothered about our “beauty” every minute of every day. There’s more to us than just our VANITY! Being a woman in 2017 means to drive your own cars… heck, we even buy our own cars! And our own dresses, and our own jewelry, and everything there is. We are Independent today and don’t rely on anyone to ‘sponsor’ us all of the time. We don’t obsess with the gol roti. We love to cook, we hate to cook, we do it on our own, we outsource it – To each her own! The women of 2017 are the Cinderellas who pick up our Prince from his Palace before we head to the ball together. We are the fairy-tale princesses who gave it back to their stepmother for being unkind and unfair. We don’t depend on our guys to take us out for a vacation or a movie, we have loads of our own company and it takes minutes to come up with a plan. And if we really need a good break, we totally enjoy being by ourselves too. We multitask more than anyone else when we step into the role of being a Mother. No one can challenge us there. Period. We are confident, headstrong, spine-strong and we march ahead! We are proud of being a Woman in 2017, and nothing holds us back!! I’m also specifically proud of the fact that being a woman in 2017 has its perks of having our “girl gang” coming to help every single time. We are not the “jealous” or the “Chitty-chatty” stereotype anymore. Be it your emotional journey, your professional journey or even your personal life – we have strong women surrounding us, ever willing to help. I am definitely proud of my girl clan because eventually, we have learned to support each other instead of pulling each other down. All because we know that together we fly, and alone, we fall. CHEERS TO WOMANHOOD! CHEERS TO BEING A WOMAN! If you liked this article, don’t forget to share it with your friends, especially your girl gang! You may also like to read 8 Things that ACTUALLY happened to me as a parent. Great!.. so true about the today’s women! So apt, today’s women aren’t the one who will wait for their Prince Charming. They are self- reliant in every sense. 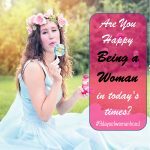 WOW….we are the Cinderellas who pick up our Prince from his Palace, perfect way to describe the women of 2017 who are happy being a woman, it was a pleasure reading your post, it holds so true in many ways and I am sure all the women can relate to it closely. Cheers to womanhood!! These are so true. We are strong enough to carry ourselves by our own. This one has such a fun filled take on the women of today that it had me in splits while I was nodding my head in affirmation. Loved it. What a wonderful take on women of today. I completely second you on this. We are fierce and go getters in real sense. This is such a well written post! Woman power, all the way! Thoroughly enjoyed reading your blog. We do not obsess over eating roti everyday, let alone eating round ones. Well, I was the Cinderella in my story who picked her prince and living her happily ever after. I can totally relate to everything you have written. Great read! Loved reading this, I do feel like Cinderella who chose her own prince, Your post makes me feel so positive and confident. Thanks for sharing this! Now I am much more proud of myself. This blog post is super inspirational and uplifting, loved it!! Modern day Cinderella’s don’t sit and wait for their Prince Charming. We can look for him or even disapprove of him if we like. Loved the way you’ve portrayed the woman of today! Such a refreshing burst of positivity and hope among all the doom & gloom posts! Really enjoyed reading it. I think those days are long gone when we needed someone else to make ua happy, buy us costly gifts or even to look down on us. Hope men too can come to these terms soon and appreciate us as human beings. I always enjoy reading your posts Prisha but this one by far was your best…making me realise the things that I am actually proud about ..
your posts always strike a chord with me, always so real and always a treat to read thanks for sharing. cheers to womanhood ! cheers to us ! Prisha I absolutely love the way you use gifs in your blog posts. they really do give you that edge. Your posts are also so real and relatable. Women are living on their own terms and carving their own paths. Such a motivating post, it’s a great pleasure & feels proud to be a women. Oh this was so great to read. You feel all pumped up and ready to charge. Having a girl gang is such a blessing. Things have changed a lot since then and it’s heartening to see how more and more girls are independent strong and amazing.